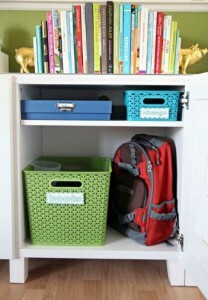 The kids are going back to school and you’re ready to transition into a more “clutter free” culture. Here’s how you can keep back-to-school supplies up and off the floor this year. Avoid having to have the same conversation over and over again this year. Instead of telling your kids to clean their rooms and keep their clothes off the floor for the millionth time, try this—a clothes organizer. Make time during the beginning of each week (Sunday’s are great) to go through and pick out an outfit for every day that week. Not only will this avoid morning frustrations and room tornados, but it’ll also keep unwanted clothes from piling up throughout the week. A win-win! Back-to-school shopping is always fun. New notebooks, pens/pencils, binders, and clothes! This year, before you take the plunge on Fall 2016’s latest and greatest, take a night to go through your child’s wardrobe and either donate or pack away clothes that no longer fit or are no longer in-season. It’ll make wardrobe decision-making less overwhelming if they have less to choose from. If you’re constantly tripping over your child’s shoes and backpack, give them a designated area for their gear. A cubby or even a simple coat hook is a great way to get stuff up and off the floor and avoid an unwanted trip to the E.R. When you get home, the first thing you probably do after you greet your kids is head to the kitchen to get started on dinner. If you find yourself constantly working around their books and homework, it can make dinner time more stressful than it needs to be. Avoid the frustration on both ends by creating a space that is dedicated to homework, preferably at an area that gives both of you the space needed to complete all of the tasks at hand. Are you wanting to dive further into your home organization? Follow Carpetland USA on Pinterest and take a look through our Home Organization board!